Remember when Fortune magazine wrote in September that Facebook co-founder and CEO Mark Zuckerberg had reportedly bagged a bison as part of a “personal challenge” to eat only what he had killed? 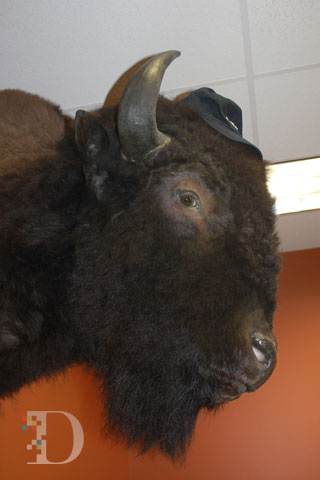 Well, proof of that is hard to miss, now that the ginormous mounted head of said dead bison has been hung on the wall of a Facebook conference room used by the social networking site’s COO Sheryl Sandberg. Zuckerberg placed it there recently as a prank, to surprise his top exec with the installation of the very hairy bison when she was away from Facebook’s Silicon Valley HQ. And surprised she was when she got back and was faced with the creature, which pretty much takes up the whole room, as you can see above and below. 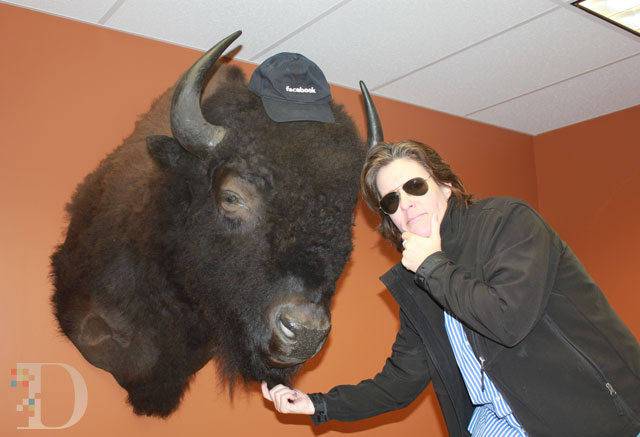 In fact, it’s been quite a lot of bison for the famous entrepreneur since he felled the majestic beast. According to Wikipedia, bison usually weigh 700 to 2,200 pounds, but can be as much as 3,800 pounds. That’s a lot of burgers! To get them, Zuckerberg learned the most humane approach and then shot the beast in California, after obtaining a hunting license and, presumably, a very big gun. Clearly, he was serious when he told Fortune in May that “the only meat I’m eating is from animals I’ve killed myself.” Among the early victims, which grew in size, were a lobster, a chicken, a pig and a goat. At this time, the Winklevii are still roaming the plains — and it would be illegal and just plain mean on Zuckerberg’s part to frag them any more than he already has. So, he went for the bison, the next biggest beast in his cross-hairs. Its head will be moved to Facebook’s new headquarters today along with the rest of the company, who will now work in spacious new digs. Which, I am told, could easily fit a herd of elephants — but let’s not go there.